This is “Managing Information and Technology”, chapter 15 from the book An Introduction to Business (v. 1.0). For details on it (including licensing), click here. 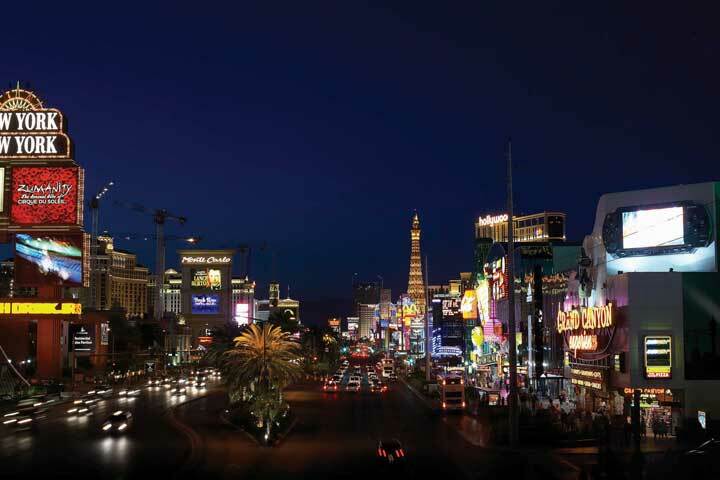 If you enjoy gambling and want to be pampered, the Las Vegas Strip is the place for you. The four-mile stretch is home to some of the world’s most lavish hotels and casinos, each competing for its share of the thirty-six million visitors who pack the city each year.Robert L. Shook, Jackpot! Harrah’s Winning Secrets for Customer Loyalty (Hoboken, NJ: John Wiley & Sons, 2003), xi. The Strip is a smorgasbord of attractions. At the luxurious Mirage, you can witness the eruption of a seventy-foot volcano every quarter hour. The five-star Bellagio resort boasts a $300 million art collection (including Picassos and Van Goghs). There are star-studded shows, upscale retailers, and posh restaurants with award-winning chefs. You can relax at pools and spas or try your luck in the casinos. Harrah’s has become an industry leader in the gaming and entertainment industry by effectively using technology. So how does a gaming and entertainment company compete in this environment? If you’ve ever been to Las Vegas, you know that a lot of them erect mammoth, neon-bathed, brick-and-mortar casino-resorts. A few, however, do what Harrah’s did in the late 1990s: they invest heavily in technology and compete through the effective use of information. What kind of information? Marketers at Harrah’s collect information about the casino’s customers and then use it to entice the same people to return. Does the strategy work? Harrah’s is an industry leader. Throughout this chapter, we’ll discuss the information needs of Harrah’s top executives, managers, and other employees. We’ll examine the ways in which the company uses technology to collect data and process them into information that can be used at every level of the organization. Explain how IS managers capture, store, and analyze data. Did you ever think about how much data you yourself generate? Just remember what you went through to start college. First, you had to fill out application forms asking you about test scores, high school grades, extracurricular activities, and finances, plus demographic data about you and your family. Once you’d picked a college, you had to supply data on your housing preferences, the curriculum you wanted to follow, and the party who’d be responsible for paying your tuition. When you registered for classes, you gave more data to the registrar’s office. When you arrived on campus, you gave out still more data to have your ID picture taken, to get your computer and phone hooked up, to open a bookstore account, and to buy an on-campus food-charge card. Once you started classes, data generation continued on a daily basis: your food card and bookstore account, for example, tracked your various purchases, and your ID tracked your coming and going all over campus. And you generated grades. And all these data apply to just one aspect of your life. You also generated data every time you used your credit card and your cell phone. Who uses all these data? How are they collected, stored, analyzed, and distributed in organizations that have various reasons for keeping track of you? To answer such questions, let’s go back to our Harrah’s example. As we’ve seen, Harrah’s collects a vast amount of data. Its hotel system generates data when customers make reservations, check in, buy food and beverages, purchase stuff at shops, attend entertainment events, and even relax at the spa. 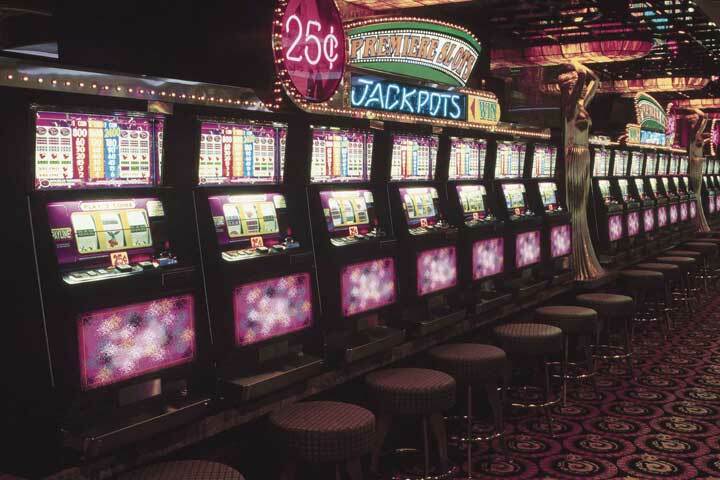 In the casino, customers apply for rewards programs, convert cash to chips (and occasionally chips back to cash), try their luck at the tables and slots, and get complimentary drinks. Then, there are the data generated by the activities of the company itself: employees, for instance, generate payroll and benefits data, and retail operations generate data every time they buy or sell something. Moreover, if we added up all these data, we’d have only a fraction of the amount generated by the company’s gaming operations. How does Harrah’s handle all these data? First of all, it captures and stores them in several databasesElectronic collection of related data accessible to various users.—electronic collections of related data that can be accessed by various members of the organization. Think of databases as filing cabinets that can hold massive amounts of organized information, such as revenues and costs from hotel activities, casino activities, and events reservations at each of Harrah’s facilities. What if Harrah’s wants to target customers who generate a lot of revenue, by using a program designed to entice return visits? How would it identify and contact these people? Theoretically, it could search through the relevant databases—those that hold customer-contact information (such as name and address) and information about customer activity in the company’s hotels, casinos, and entertainment venues. It would be a start, perhaps, but it wouldn’t be very efficient. First of all, it would be time-consuming. Plus, what if the same data weren’t stored in a similar fashion in each database? In that case, it would be quite hard to combine the data in a meaningful way. 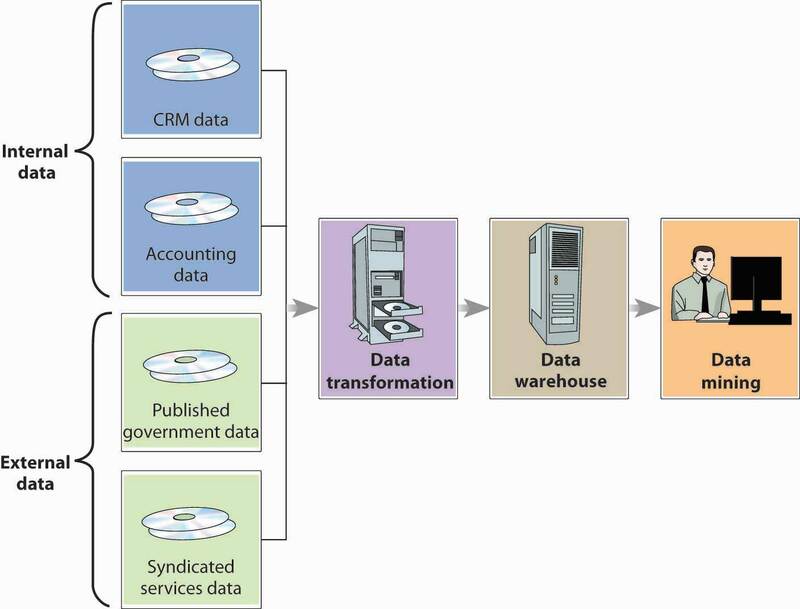 To address this problem, Harrah’s managers will rely on a system like the one illustrated in Figure 15.4 "The Data Mining Process", which calls for moving all the relevant data into a data warehouseCentralized database that stores data from several databases so they can be easily analyzed.—a centralized database in which data from several databases are consolidated and organized so that they can be easily analyzed. With the data in one central location, management can find out everything it needs to about a particular group of customers. It can also use the data to address some pretty interesting questions. Why do people come to our casinos? How can we keep customers coming back? How can we increase the number of visits per customer? How can we increase the amount they spend on each visit? What incentives (such as free dinners, hotel rooms, or show tickets) do our customers like most? To come up with answers to these questions, they’ll perform a technique called data miningTechnique used to search and analyze data to reveal patterns and trends that can be used to predict future behavior.—the process of searching and analyzing large amounts of data to reveal patterns and trends that can be used to predict future behavior. By data-mining its customer-based data warehouse, Harrah’s management can discover previously unknown relationships between the general behavior of its customers and that of a certain group of customers (namely, the most profitable ones). Then, it can design incentives to appeal specifically to those people who will generate the most profit for the company. To get a better idea of how data mining works, let’s simplify a description of the process at Harrah’s. First, we need to know how the casino gathered the data to conduct its preliminary analysis. Most customers who play the slots use a Harrah’s player’s card that offers incentives based on the amount of money that they wager on slot machines, video poker, and table games.Harrah’s, “Total Rewards,” http://www.harrahs.com/total_rewards/overview/overview.jsp (accessed June 2, 2006). To get the card, a customer must supply some personal information, such as name, address, and phone number. From Harrah’s standpoint, the card is extremely valuable because it can reveal a lot about the user’s betting behavior: actual wins and losses, length of time played, preferred machines and coin denominations, average amount per bet, and—most important—the speed with which coins are deposited and buttons pushed.Robert L. Shook, Jackpot! Harrah’s Winning Secrets for Customer Loyalty (Hoboken, NJ: John Wiley & Sons, 2003), 228–29. As you can see from Figure 15.4 "The Data Mining Process", Harrah’s primary data source was internal—generated by the company itself rather than provided by an outside source—and drew on a marketing database developed for customer relationship management (CRM). Harrah’s collects data on its customers by using players’ cards to gather information and to track betting behavior. What does the casino do with the data that it’s mined? Harrah’s was most interested in “first trippers”—first-time casino customers. In particular, it wanted to know which of these customers should be enticed to return. By analyzing the data collected from player’s-card applications and from customer’s actual play at the casino (even if for no more than an hour), Harrah could develop a profile of a profitable customer. Now, when a first-timer comes into any of its casinos and plays for a while, Harrah’s can instantly tell whether he or she fits the profitable-customer profile. To lure these people back for return visits, it makes generous offers of free or reduced-rate rooms, meals, entertainment, or free chips (the incentive of choice for Harrah’s preferred customers). These customers make up 26 percent of all Harrah’s customers and generate 82 percent of its revenues. Surprisingly, they’re not the wealthy high rollers to whom Harrah’s had been catering for years. Most of them are regular working people or retirees with available time and income and a fondness for slots. They generally stop at the casino on the way home from work or on a weekend night and don’t stay overnight. They enjoy the thrill of gambling, and you can recognize them because they’re the ones who can’t pump coins in fast enough.Gary Loveman, “Diamonds in the Data Mine,” Harvard Business Review, May 2003, 3. Organizations capture and store data in databases—electronic collections of related data that can be accessed by various people in the organization. To facilitate data analysis, IS managers may move data from various databases into a data warehouse—a centralized database in which data are consolidated and organized for efficient analysis. To come up with answers to a huge range of questions, managers perform a technique called data mining—the process of searching and analyzing large amounts of data to reveal patterns and trends that can be used to predict future behavior. Harrah’s uses data mining to identify its most profitable customers and predict their future behavior. It then designs incentives to appeal specifically to these customers. Do you see any ethical problems with this process? Is it ethical to encourage people to gamble? Explain your answer. Discuss ways in which an IS can be designed to meet the needs of individuals at various organizational levels. As we saw earlier, different managers, operational units, and functional areas have different information needs. That’s why organizations often tailor information systems to meet particular needs. Harrah’s IT group, for example, developed the Player Contact SystemDarrell Dunn, “Client-Tracking System Helps Harrah’s Tailor Sales Efforts for Frequent Visitors,” Information Week, November 4, 2003, http://www.informationweek.com/story/showArticle.jhtml?articleID=16000115 (accessed June 2, 2006). to help its casino salespeople connect to top customers on a more personal basis. Working from a prioritized list of customer names displayed on a computer screen, the salesperson clicks on a name to view relevant information about the customer, such as background and preferred casino activities. There’s even a printed script that can be used to guide the conversation. Such a system isn’t very helpful, however, to middle or top-level managers, who need systems to help them carry out their oversight and planning responsibilities. To design marketing programs, for instance, marketing managers rely on summary information gleaned from a dedicated customer-relationship management system. Let’s look at some of the widely available information systems designed to support people at the operational and upper-management levels. Operations support systemsInformation system used by lower-level managers to assist them in running day-to-day operations and making routine decisions. are generally used by managers at lower levels of the organization—those who run day-to-day business operations and make fairly routine decisions. They may be transaction processing systems, process control systems, or design and production systems. Most of an organization’s daily activities are recorded and processed by its transaction processing system (TPS)Information system used to record and process an organization’s daily activities or transactions., which receives input data and converts them into output—information—intended for various users. Input data are called transactionsFinancial and nonfinancial events that affect a business.—events that affect a business. A financial transaction is an economic event: it affects the firm’s assets, is reflected in its accounting statements, and is measured in monetary terms. Sales of goods to customers, purchases of inventory from suppliers, and salaries paid to employees are all financial transactions. Everything else is a nonfinancial transaction. The marketing department, for example, might add some demographic data to its customer database. The information would be processed by the firm’s TPS, but it wouldn’t be a financial transaction. 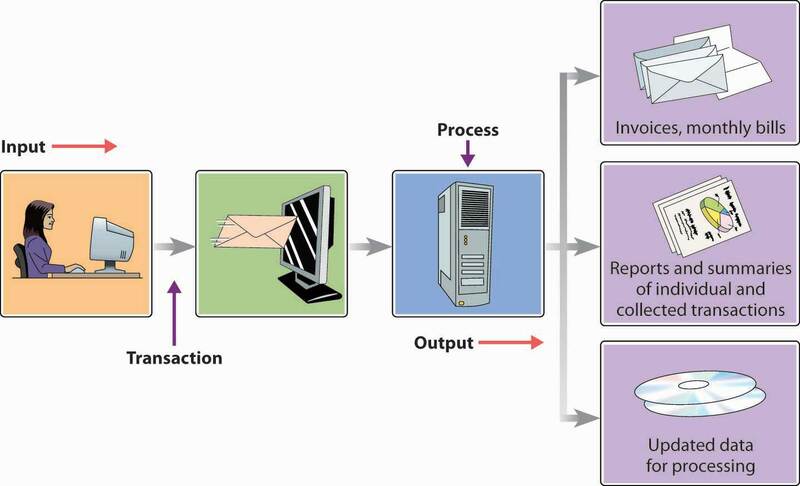 Figure 15.6 "Transaction Processing System" illustrates a TPS in which the transaction is a customer’s electronic payment of a bill. As you can see, TPS output can consist not only of documents sent to outside parties (in this case, notification of payment received), but also of information circulated internally (in the form of reports), as well as of information entered into the database for updating. Process controlApplication of technology to monitor and control physical processes. refers to the application of technology to monitor and control physical processes. It’s useful, for example, in testing the temperature of food as it’s being prepared or gauging the moisture content of paper as it’s being manufactured. Typically, it depends on sensors to collect data periodically. The data are then analyzed by a computer programmed either to make adjustments or to signal an operator. Harrah’s uses process-control technology to keep customers happy. At any given point, some slot machines are down, whether because a machine broke or ran out of money or somebody hit the jackpot. All these contingencies require immediate attention by a service attendant. In the past, service personnel strolled around looking for machines in need of fixing. Now, however, a downed slot machine sends out an “I need attention” signal, which is instantly picked up by a monitoring and paging system called MessengerPlus and sent to a service attendant. As we saw in Chapter 11 "Operations Management in Manufacturing and Service Industries", modern companies rely heavily on technology to design and make products. Computer-aided design (CAD)System using computer technology to create models representing the design of a product. software, for instance, enables designers to test computer models digitally before moving new products into the prototype stage. Many companies link CAD systems to the manufacturing process through computer-aided manufacturing (CAM)System using computer technology to control production processes and equipment. systems that not only determine the steps needed to produce components but also instruct machines to do the necessary work. A CAD/CAM system can be expanded by means of computer-integrated manufacturing (CIM)System in which the capabilities of a CAD/CAM system are integrated with other computer-based functions., which integrates various operations (from design through manufacturing) with functional activities ranging from order taking to final shipment. The CIM system may also control industrial robots—computer-run machines that can perform repetitive or dangerous tasks. A CIM system is a common element in a flexible manufacturing system (FMS)System in which computer-controlled equipment is programmed to handle materials used in manufacturing., which makes it possible to change equipment setups by reprogramming computer-controlled machines that can be adapted to produce a variety of goods. Such flexibility is particularly valuable to makers of customized products. Mid- and upper-level managers rely on a variety of information systems to support decision-making activities, including management information systems, decision support systems, executive support systems, and expert systems. A management information system (MIS)System used to extract data from a database and compile reports that help managers make routine decisions. extracts data from a database to compile reports, such as sales analyses, inventory-level reports, and financial statements, to help managers make routine decisions. The type and form of the report depend on the information needs of a particular manager. 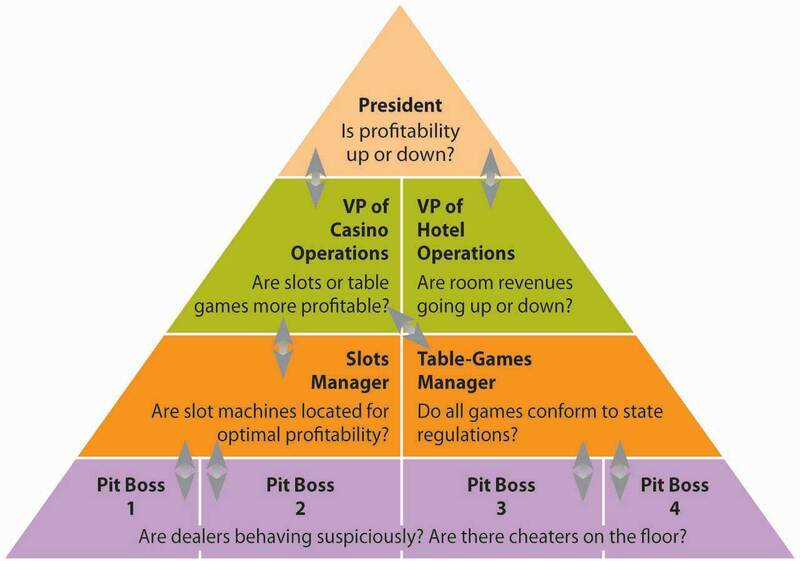 At Harrah’s, for example, several reports are available each day to a games manager (who’s responsible for table-game operations and personnel): a customer-analysis report, a profitability report, and a labor-analysis report.Robert L. Shook, Jackpot! Harrah’s Winning Secrets for Customer Loyalty (Hoboken, NJ: John Wiley & Sons, 2003), 248–52. A decision support system (DSS)Interactive system that extracts, integrates, and displays data from multiple sources to help managers make nonroutine decisions. is an interactive system that collects, displays, and integrates data from multiple sources to help managers make nonroutine decisions. For example, suppose that a gaming company is considering a new casino in Pennsylvania (which has just legalized slot machines). To decide whether it would be a wise business move, management could use a DSS like the one illustrated in Figure 15.7 "Decision Support System". The first step is to extract data from internal sources to decide whether the company has the financial strength to expand its operations. From external sources (such as industry data and Pennsylvania demographics), managers might find the data needed to determine whether there’s sufficient demand for a casino in the state. 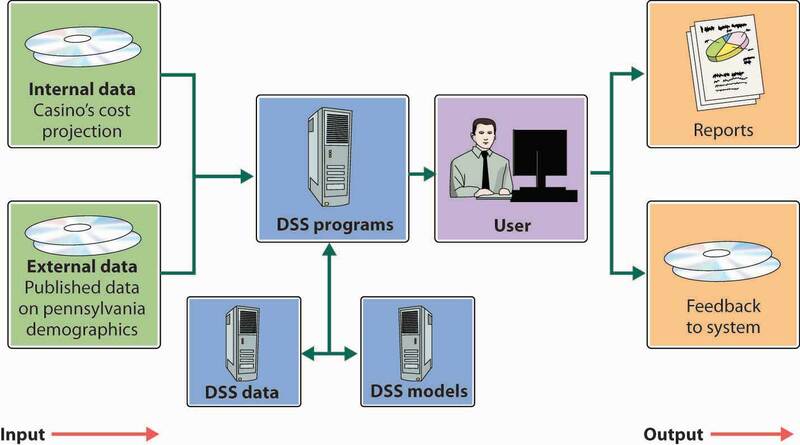 The DSS will apply both types of data as variables in a quantitative model that managers can analyze and interpret. People must make the final decision, but in making sense of the relevant data, the DSS makes the decision-making process easier—and more reliable.“Decision Support System,” Webopedia, http://www.webopedia.com/TERM/D/decision_support_system.html (accessed June 2, 2006). As we observed in Chapter 6 "Managing for Business Success", senior managers spend a good deal of their time planning and making major decisions. They set performance targets, determine whether they’re being met, and routinely scan the external environment for opportunities and threats. To accomplish these tasks, they need relevant, timely, easily understood information. Often, they can get it through an executive information system (EIS)System that provides senior managers with strategic information customized to meet their needs and presented in a convenient format., which provides ready access to strategic information that’s customized to their needs and presented in a convenient format. Using an EIS, for example, a gaming-company executive might simply touch a screen to view key summary information that highlights in graphical form a critical area of corporate performance, such as revenue trends. After scanning this summary, our executive can “drill down” to retrieve more detailed information—for example, revenue trends by resort or revenue trends from various types of activities, such as gaming, hotel, retail, restaurant, or entertainment operations. Artificial intelligence (AI)Science of developing computer systems that can mimic human behavior. is the science of developing computer systems that can mimic human behavior. Ever since the term was coined in 1956, AI has always seemed on the verge of being “the next big thing.” Unfortunately, optimistic predictions eventually collided with underwhelming results, and many experts began to doubt that it would ever have profitable applications.“Artificial Intelligence,” Webopedia, http://www.webopedia.com/TERM/artificial_intelligence (accessed June 2, 2006). In the last decade, however, some significant advances have been made in AI—albeit in the area of game playing, where activities are generally governed by small sets of well-defined rules. But even the game-playing environment is sometimes complex enough to promote interesting developments. In 1997, for example, IBM’s Deep Blue—a specialized computer with an advanced chess-playing program—defeated the world’s highest-ranked player.“Artificial Intelligence,” Webopedia, http://www.webopedia.com/TERM/artificial_intelligence (accessed June 2, 2006). More recently, several AI applications have been successfully put to commercial use. Let’s take a brief look at two of these: expert systems and face-recognition technology. Expert systems (ES)Program that mimics the judgment of experts. are programs that mimic the judgment of experts by following sets of rules that experts would follow. They’re useful in such diverse areas as medical diagnosis, portfolio management, and credit assessment. For example, you’ve called the customer-service department of your credit-card company because you want to increase your credit line. Don’t expect to talk to some financial expert who’s authorized to say yes or no. You’ll be talking to a service representative with no financial expertise whatsoever. He or she will, however, have access to an ES, which will give you an answer in a few seconds. How does it work? The ES will prompt the representative to ask you certain questions about your salary and living expenses. It will also check internal corporate data to analyze your purchases and payment behavior, and, based on the results, it will determine whether you get an increase and, if so, how much. At Harrah’s, an ES called the Revenue Management System helps to optimize the overall profitability of both hotel and casino operations. When a customer requests a room, the program accesses his or her profile in the database and consults certain “rules” for assessing the application.John Goff, “Head Games: Businesses Deploying Analytical Software to Get a Better Fix on Customer Behavior,” CFO Magazine for Senior Financial Executives 20:9, July 1, 2004, http://www.cfo.com/article.cfm/3014815 (accessed June 2, 2006). One rule, for example, might be: “If the customer has wagered more than $100,000 in the past year, add 10 points.” Eventually, the system decides whether your application will be accepted (and at what rate) by adding up points determined by the rules. While a tightwad may not get a room even when there are vacancies, a high roller may get a good rate on a luxury suite even if the hotel is nearly full. Harrah’s uses another particularly interesting, and sophisticated, application of AI. In the hotel-casino business, it’s crucial to identify and turn away undesirable visitors. One tool for this task is a digital camera-surveillance system that uses face-recognition technology. Using this technology, a program classifies a person’s face according to the presence/absence or extent of certain unique features, such as dimpled chins, receding jaws, overbites, and long or short noses. If there’s a match on, for example, fifteen features between a person being scanned and someone in the company database, a staff member decides whether the two people are the same. If a security manager then concludes that the face belongs to a skilled card-counter, the customer will be discouraged from playing blackjack; if it belongs to a known cheater, the individual will be escorted out of the casino. The system, however, does more than spot undesirables. It can also identify high rollers and send information about customers to managers on the floor. That’s why a Harrah’s manager can greet a preferred customer at the door with his favorite drink and a personalized greeting, such as “Hi, Bill! How’s Karen? Did you ever get that vintage Corvette? Here, have a gin rickey on the house.”See Daintry Duffy, “Technology’s Winning Hand,” CSO.online, October 1, 2003, http://www.csoonline.com/read/100103/kind_sidebar_1787.html (accessed June 2, 2006). ; Larry Barrett Gallagher and Sean Gallagher, “NORA and ANNA: Non-Obvious Relationship Awareness,” Baseline, April 4, 2004, http://www.baselinemag.com/article2/0,1397,1615733,00.asp (accessed June 2, 2006). Information needs vary according to managerial level (top, middle, or first-line). Low-level managers—those who run day-to-day operations and make routine decisions—use operations support systems, which usually fall into three categories: transaction processing systems, process control systems, and computer-aided design software. Most daily activities are recorded and processed by a transaction processing system, which receives input data and converts them into output—information—intended for various users. Process control refers to the application of technology to monitor and control physical processes, such as food preparation. The system depends on sensors to collect data for analysis by a computer programmed either to make adjustments or to signal an operator. Technology can be used to design and make products. Computer-aided design (CAD) software, for instance, enables designers to test computer models digitally before moving new products into the prototype stage. Mid- and upper-level managers may use one of four types of management support system to assist in decision-making activities: management information systems, decision support systems, executive information systems, and expert systems. 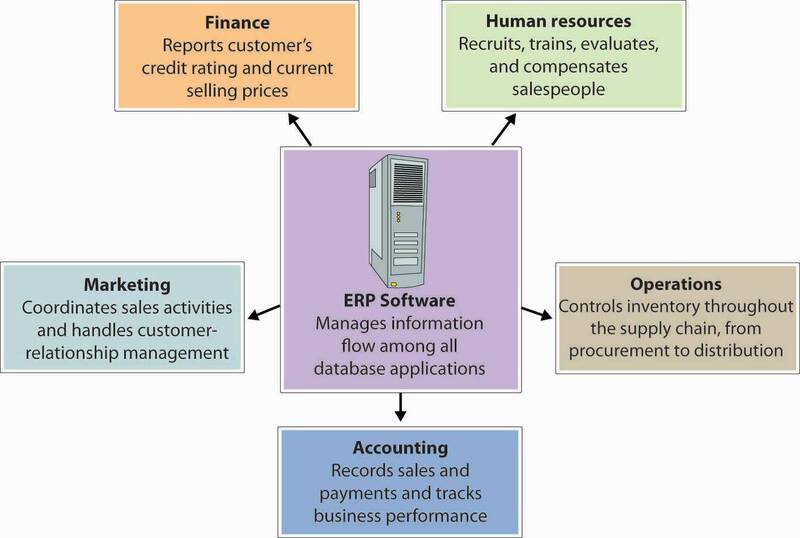 A management information system (MIS) extracts data from a database to compile reports, such as sales analyses, needed for making routine decisions. A decision support system (DSS) is an interactive system that collects and integrates data from multiple sources to assist in making nonroutine decisions. To develop plans and make major decisions, managers may gather relevant, timely, easily understood information through an executive information system (EIS); an EIS provides ready access to strategic information that’s customized to their needs and presented in a convenient format. An expert system (ES) mimics expert judgment by following sets of rules that experts would follow; it relies on artificial intelligence (AI)—the science of developing computer systems that can mimic human behavior. For each of the following situations, select the appropriate management support system (MSS) to aid the user: decision support system, executive support system, or expert system. In each case, describe the MSS that you recommend. You’re trying to identify a rash on your arm. You own two golf courses in the Northeast, and you’re thinking about building one in Florida. You need to gather and analyze information about your current operations in the Northeast, as well as external information about the golf industry in Florida. You own three McDonald’s franchises. Every morning, you want to know the revenues and costs at each store. You’re also interested in a breakdown of revenues by product and costs by category of expense (salaries, food and ingredients, maintenance, and so on). Describe the main systems for sharing information through networked computers. Once it’s grown beyond just a handful of employees, an organization needs a way of sharing information. Imagine a flower shop with twenty employees. The person who takes phone orders needs access to the store’s customer list, as do the delivery person and the bookkeeper. Now, the store may have one computer and everyone could share it. It’s more likely, however, that there are a number of computers (several for salespeople, one for delivery, and one for bookkeeping). In this case, everyone needs to be sure that customer records have been updated on all computers every time that a change is required. Likewise, many companies want their personal computers to run their own software and process data independently. But they also want people to share databases, files, and printers, and they want them to share applications softwareSoftware that performs a specific task, such as word processing or spreadsheet creation. that performs particular tasks, including word processing, creating and managing spreadsheets, designing graphical presentations, and producing high-quality printed documents (desktop publishing). A local area network (LAN)Network that links computers that are in close proximity. links computers that are in close proximity—in the same building or office complex. They can be connected by cables or by wireless technology. Your university might have a LAN system that gives you access to resources, such as registration information, software packages, and printers. Figure 15.8 "Local Area Network (LAN)" illustrates a LAN that’s connected to another network by means of a gateway—a processor that allows dissimilar networks to communicate with one another. Because a wide area network (WAN)Network that links computers that are spread over a relatively large geographical area. covers a relatively large geographical area, its computers are connected by telephone lines, wireless technology, or even satellite. Computers at Harrah’s properties are linked through a WAN.Meridith LeVinson, “Jackpot! Harrah’s Big Payoff Came from Using IT to Manage Customer Information,” CIO Magazine, February 1, 2001, http://www.cio.com/archive/020101/harrah.html (accessed June 2, 2006). Like the one in Figure 15.8 "Local Area Network (LAN)", some networks are client-server systemsSystem connecting client machines (which are used by employees for data input and retrieval) and a server (that stores shared databases and programs)., which include a number of client machines (the ones used by employees for data input and retrieval) and a server (which stores the database and the programs used to process the data). Such a setup saves time and money and circulates more-accurate information. Once an organization has grown to more than a few employees, it needs to network individual computers to allow them to share information and technologies. 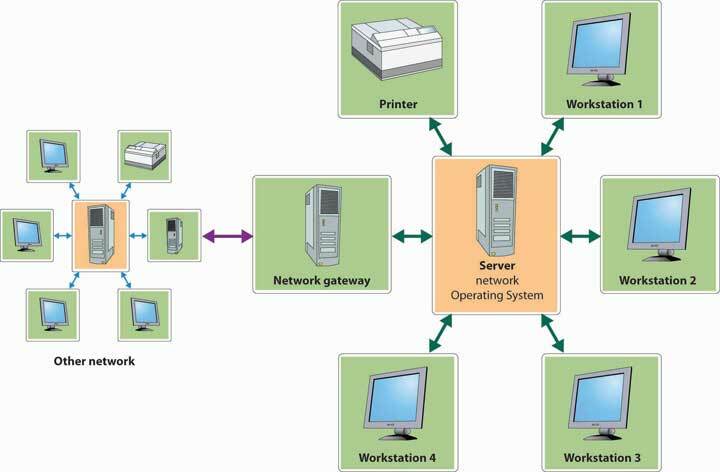 A client-server system links a number of client machines (for data input and retrieval) with a server (for storing the database and the programs that process data). Many companies want personal computers to run their own software and process data independently. But they also want individuals to share databases, files, printers, and applications software that performs particular types of work (word processing, creating and managing spreadsheets, and so forth). There are two systems that can satisfy both needs. A local area network (LAN) links computers in close proximity, connecting them by cables or by wireless technology. A wide area network (WAN) covers a relatively large geographical area and connects computers by telephone lines, wireless technology, or satellite. What’s the difference between a LAN and a WAN? Give an example of the use to which each type of system can be put. Does your college maintain either type of computer network? Explain how four networking technologies—the Internet, the World Wide Web,intranets, and extranets—make data communication possible. In addition to using networks for information sharing within the organization, companies use networks to communicate and share information with those outside the organization. All this is made possible by data communication networksLarge network used to transmit digital data from one computer to another using a variety of wired and wireless communication channels., which transmit digital data (numeric data, text, graphics, photos, video, and voice) from one computer to another using a variety of wired and wireless communication channels. Let’s take a closer look at the networking technologies that make possible all this electronic communication—in particular, the Internet (including the World Wide Web), intranets, and extranets. Though we often use the terms Internet and World Wide Web interchangeably, they’re not the same thing.See “The Difference Between the Internet and the World Wide Web,” Webopedia, http://www.webopedia.com/DidYouKnow/Internet/2002/Web_vs_Internet.asp (accessed June 2, 2006). The InternetGlobal network comprising smaller interconnected networks linking millions of computers around the world. is an immense global network comprising smaller interconnected networks linking millions of computers around the world. Originally developed for the U.S. military and later adapted for use in academic and government research, the Internet experienced rapid growth in the 1990s, when companies called Internet service providers (ISPs)Company, such as America Online, that links into the Internet infrastructure to connect paying subscribers. were allowed to link into the Internet infrastructure in order to connect paying subscribers. Today, ISPs, such as CompuServe, America Online, and MSN, enable us to use the Internet for e-mail, online conferencing, instant messaging, and real-time communication (chatting). These services also connect us with third-party providers of information, including news stories, stock quotes, and magazine articles. The World Wide WebSubsystem of computers on the Internet that communicate with each other using a special language called HTTP. (or simply “the Web”) is just a portion of the Internet—albeit a large portion. 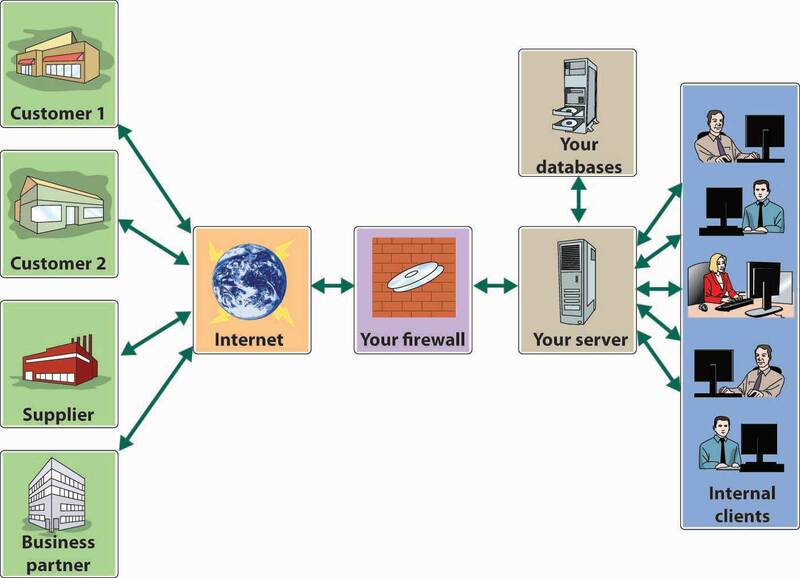 The Web is a subsystem of computers that can be accessed on the Internet using a special protocol, or language, known as hypertext transfer protocol (HTTP). What’s the difference between the Internet and the Web? According to Tim Berners-Lee (one of the small team of scientists who developed the concept for the Web in 1989), the Internet is a network of networks composed of cables and computers. You can use it to send “packets” of information from one computer to another, much like sending a postcard. If the address on the packet is accurate, it will arrive at the correct destination in much less than a second. Thus, the Internet is a packet-delivery service that delivers such items as e-mail messages all over the globe. The Web, by contrast, is composed of information—documents, pictures, sounds, streaming videos, and so on. It’s connected not through cables, but rather through hypertext links that allow users to navigate between resources on the Internet.Richard T. Griffiths, “Chapter Two: The World Wide Web (WWW),” The History of the Internet, http://www.let.leidenuniv.nl/history/ivh/chap2.htm (accessed June 2, 2006). Because it’s driven by programs that communicate between computers connected to the Internet, the Web couldn’t exist without the Internet. The Internet, on the other hand, could exist without the Web, but it wouldn’t be nearly as useful. The Internet itself is enormous, but it’s difficult to navigate, and it has no pictures, sounds, or streamed videos. They exist on computers connected to the Web, which also makes it much easier to retrieve information. 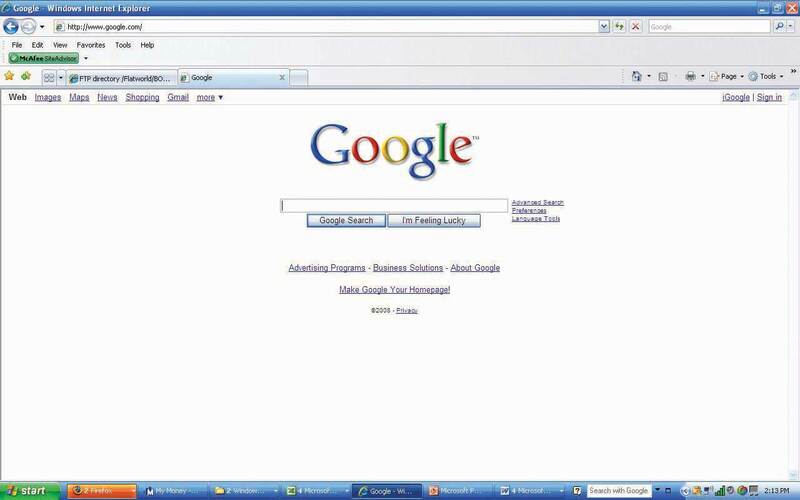 The creation of Web browsersSoftware (such as Internet Explorer) that locates and displays Web pages.—software, such as Microsoft’s Internet Explorer and Netscape Navigator, that locates and displays Web pages—opened up the Internet to a vast range of users. More than 60 percent of individuals in the United States age eighteen and older use the Internet regularly.Rob McGann, “People Aged 55 and Up Drive U.S. Web Growth,” ClickZ Network, http://www.clickz.com/stats/sectors/traffic_patterns/article.php/3446641 (accessed June 2, 2006). So, who’s in charge of the Web? No one owns it, but an organization called the World Wide Web Consortium (W3C) oversees the development and maintenance of standards governing the way information is stored, displayed, and retrieved on it.“World Wide Web,” Wikipedia, http://en.wikipedia.org/wiki/World_Wide_Web (accessed June 2, 2006). Let’s look a little more closely at some of the technologies that enable us to transmit and receive data over the Web. Documents on the Web are called Web pages, and they’re stored on Web sites. Each site is maintained by a Webmaster and opens with a home page. Each Web page is accessed through a unique address called a uniform resource locator (URL). For example, if you want to find statistics on basketball star Shaquille O’Neal, you could type in the URL address http://www.nba.com/playerfile/shaquille_oneal. The prefix http:// is the protocol name, http://www.nba.com the domain name, playerfile the subdirectory name, and shaquille_oneal the document name (or Web page). A computer that retrieves Web pages is called a Web serverComputer that retrieves Web pages.. A search engineSoftware program that scans Web pages for specified kewords and provides a list of documents containing them. is a software program that scans Web pages containing specified keywords and provides a list of documents containing them. The most popular search engine is Google; others include Yahoo!, Ask, AllTheWeb, and Hotbot. What’s the difference among the Internet, an intranet, and an extranet? It depends on who can and can’t access the information on the network. The Internet is a public network that anyone can use. A company’s intranetPrivate network using Internet technologies that are available only to employees., on the other hand, is a private network using Internet technologies that’s available only to employees; access is controlled by a software program called a firewallSoftware program that controls access to a company’s intranet.. The information available on an intranet varies by company but may include internal job postings, written company policies, and proprietary information, such as price lists meant for internal use only. An extranetIntranet that’s partially available to certain parties outside the organization. is an intranet that’s partially available to certain parties outside the organization. Say, for example, you’ve posted the following information on your intranet: company policies, payroll and benefit information, training programs, parts specifications and inventories, and production schedules. To allow suppliers to bid on contracts, you might give them access to sections of the site disclosing parts specifications, inventories, and production schedules. All other sections would be off-limits. You’d control access to employee-only and supplier-accessible sections by means of usernames and passwords. As you can see from Figure 15.10 "How an Extranet Works", which illustrates some of the connections made possible by an extranet, access can be made available to customers and business partners, as well. The level of e-commerceBusiness conducted over the Internet.—conducting business over the Internet—varies by company. Some companies, such as Amazon.com, rely on the Internet for their existence. Others, especially smaller firms, have yet to incorporate the Internet into their business models, but these companies belong to a dwindling minority: more than 60 percent of small companies and 90 percent of large companies have Web sites, and a third of the companies that maintain Web sites sell products through them.Don Jones, Mark Scott, and Rick Villars, E-Commerce for Dummies (New York: Wiley, 2001), xxvi. Larger companies now find that they must do business over the Internet, including selling and buying goods. Businesses use the Internet for four purposes: presenting information, selling products, distributing digital products, and acquiring goods and services. By posting a Web site, a company can tell people about itself, its products, and its activities. Customers can also check the status of orders or account balances. Information should always be current, complete, and accurate. Customers should be able to find and navigate the site, which should be able to accommodate them during high-use periods. Selling over the Internet—whether to individuals or to other businesses—enables a business to enlarge its customer base by reaching buyers outside its geographical area. A company selling over the Internet must attract customers to its site, make the buying process simple, assure customers that the site is secure, and provide helpful information. Some companies use the Internet to sell and deliver such digital products as subscriptions to online news services, software products and upgrades, and music and video products. In these businesses, the timely delivery of products is crucial. Sales of digital products over the Internet are expected to increase substantially in the future, particularly sales of digital music.Matt Phillips, “Digital Music Services Hit First Major Milestone as Downloads Outsell Physical Formats for the First Time,” British Phonographic Industry, September 2, 2004, http://www.bpi.co.uk/index.asp?Page=news/stats/news_content_file_743.shtml (accessed June 2, 2006). E-purchasing (which we introduced in Chapter 11 "Operations Management in Manufacturing and Service Industries") saves time, speeds up delivery, reduces administrative costs, and fosters better communications between a firm and its suppliers. Most importantly, it cuts the costs of purchased products because it’s now feasible for buyers to request competitive bids and do comparative shopping. Many companies now use a technology called electronic data interchange (EDI)Computerized exchange of business transaction documents. to process transactions and transmit purchasing documents directly from one IS to another. 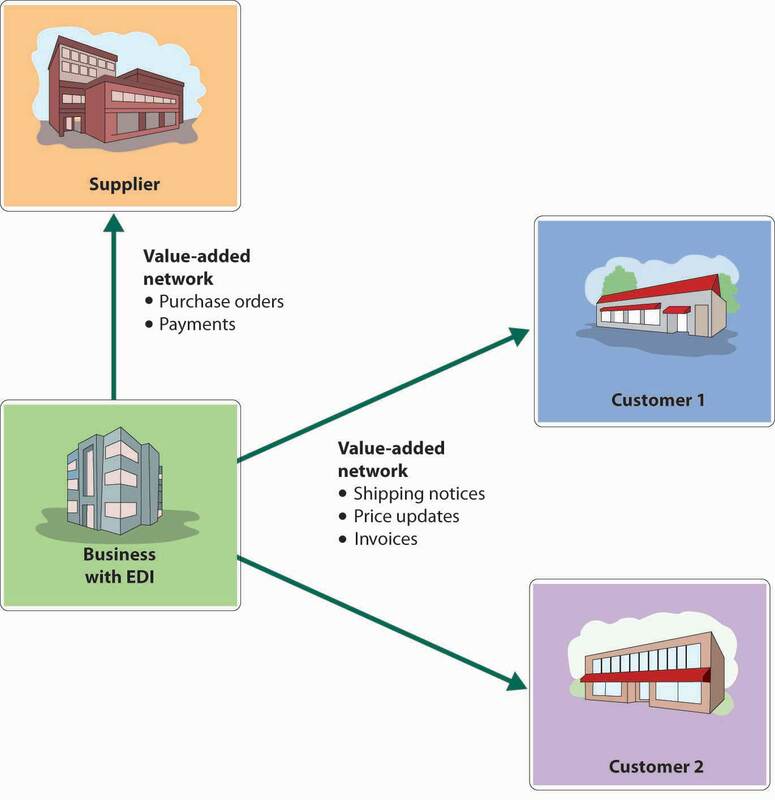 Figure 15.11 "EDI and Value-Added Networks" shows an EDI system at a company that subscribes to a value-added network—a private system supplied by a third-party firm—over which it conducts a variety of transactions. Imagine a company that retails products for schoolteachers over the Internet—for example, books, software, and teaching supplies purchased from various manufacturers and distributors. It would need facilities to store inventories and personnel to handle inventories and fill customer orders. But what if this company decided to get out of the traditional retail business? What if it decided instead to team up with three trading partners—a book publisher, a software developer, and a manufacturer of office supplies? Our original company could re-create itself as a Web site for marketing the books, software, and supplies provided by its partners, without taking physical possession of them. It would become a virtual companyCompany without a significant physical presence that relies on third parties to produce, warehouse, price, and deliver the products it sells over the Internet.. Its partners would warehouse their own products and furnish product descriptions, prices, and delivery times. Meanwhile, the virtual company, besides promoting all three lines of products, would verify customer orders and forward them to its partners, who would ship their own products directly to customers. All four partners would be better off, because they’d be competing in a business in which none of them could compete by itself. This business approach has allowed Spun.com, a CD Internet retailer, to avoid carrying the $8 million inventory that it would have needed to support its sales. Rather than hold its own inventory, Spun.com merely passes the orders on to Alliance Entertainment (a home entertainment products wholesale distributor), which ships them directly to customers.“Can E-Tailers Find Fulfillment with Drop Shipping?” Research at Penn, http://www.upenn.edu/researchatpenn/article.php?21&bus (accessed June 2, 2006). Data communication networks transmit digital data from one computer to another computer using a variety of wired and wireless communication channels. One such network, the Internet, is an immense global network of smaller interconnected networks linking millions of computers. By connecting paying subscribers into the Internet infrastructure, a company called an Internet service provider (ISP) provides services, such as e-mail, online conferencing, and instant messaging. A large portion of the Internet, the World Wide Web (“the Web”), is a subsystem of computers that can be accessed by means of a special protocol known as hypertext transfer protocol (HTTP). Computers on the Web are connected with hypertext links that permit users to navigate among Internet resources. A Web browser is software that locates and displays Web pages. Though the Web couldn’t exist without the Internet, it’s the Web that provides such multimedia material as pictures, sounds, and streaming videos. Businesses use the Internet for four purposes: presenting information, selling products, acquiring goods and services, and distributing digital products. While the Internet is a public network that anyone can use, a company’s intranet is a private network that’s available only to its employees; access is controlled by a software program called a firewall. An extranet is an intranet that’s partially available to certain outside parties, such as suppliers. If asked by your instructor, how would you explain the difference between the Internet and the World Wide Web? Identify ten specific ways in which your college uses the Internet. Identify career opportunities in information management. The number and variety of opportunities in the IS field have grown substantially as organizations have expanded their use of IT. In most large organizations, the senior management team includes a chief information officer (CIO) who oversees information and telecommunications systems. A large organization might also have a chief technology officer who reports to the CIO and oversees IT planning and implementation. Most entry-level IS jobs require a business degree with a major in information systems. Many people supplement their IS majors with minors in computer science or some other business area, such as accounting, finance, marketing, or operations management. The number and variety of opportunities in the information systems (IS) field have grown substantially as companies have expanded their use of information technology. The senior management team in large organizations includes a chief information officer who oversees information and a chief technology officer who oversees IT planning and implementation. Most entry-level IS jobs require a business degree with a major in information systems. Many supplement their IS majors with computer science or some other business area, such as accounting, finance, marketing, or operations management. Those entering organizations with IS degrees may choose to follow either a management or a technology path. Why is studying IT important to you as a student? How will competency in this area help you get and keep a job in the future? What can you do to protect yourself against viruses? Could You Manage a Job in IT or IS? What kinds of jobs do IT managers perform? What educational background, work experience, and skills are needed for positions in IT management? What’s the current job outlook for IS and IT managers? What factors drive employment opportunities? What’s the median annual income of a mid-level IT manager? Campus Commando or Common Criminal? Do you want to be popular (or at least more prominent) on campus? You could set up a Web site that lets fellow students share music files over the campus network. All you have to do is seed the site with some of your own downloaded music and let the swapping begin. That’s exactly what Daniel Peng did when he was a sophomore at Princeton. It was a good idea, except for one small hitch: it was illegal, and he got caught. Unimpressed with Peng’s technological ingenuity, the Recording Industry Association of America (RIAA) sued him, and he was forced to settle for $15,000. Instead of delivering music, Peng’s Web site now asks visitors to send money to help defray the $15,000 and another $8,000 in legal costs. The practice of sharing commercial music files is illegal. Do you think that it’s also unethical? Why, or why not? What steps to curb the practice are being taken by the music industry? By college administrators? By the government? Do you approve of these steps? Have they been effective? What, ultimately, do you see as the solution to the problem? Services. How will you earn revenues? What services will you offer? How will you price these services? What forms of payment will you accept? Will you sell ads? If so, what kinds? Appearance. What will your site look like? Will it have graphics? Sound? Video? What will your domain name be? What information will you collect from customers? What information will you provide to visitors? Attracting Customers. How will you attract customers to the site? How will you monitor and analyze site activity? Security. How will you guarantee confidentiality? How will you ensure that your site is secure? How will you limit access to students at your school? Opportunities and Challenges. What opportunities do e-businesses offer? What challenges do they create? How would your business model change if you decided to run it as a traditional business rather than as an e-business? Hewlett-Packard (HP) provides technology solutions to individuals, businesses, and institutions around the world. It generates annual revenues of $80 billion from the sale of IT products, including computers, printers, copiers, digital photography, and software. Anyone in the United States who wants to buy an HP product, get technical support, download software, learn about the company, or apply for a job can simply go to the HP Web site. But what if you live in Hong Kong? How would you get answers to your questions? You’d do the same thing as people in this country do—go to HP’s Web site. Try to imagine, however, the complex process of developing and maintaining a Web site that serves the needs of customers in more than seventy countries. To get a better idea, go to the HP Web site (http://www.hp.com). Start by looking at HP’s line of notebooks and checking its prices. Then, review the company information that’s posted on the site, and, finally, look for a job (it’s good practice). How easy was it to navigate the site and to switch back and forth between the U.S. and Hong Kong sections of the site? Identify at least five differences between the two sections. Does HP’s Web site meet the needs of customers in both the United States and Hong Kong? Why, or why not? How could it be improved?